New mineral sands projects in Africa and upgrades of mineral sands dry mills in Australia have meant new orders for bulk bagging systems and in-process impact weigher samplers for Adelaide manufacturer Flow Force Technologies over the 12 months since March last year. Automatic bag inflation and dust extraction were added to simplify operator involvement and speed up the bagging process. shut the air valve quickly after the period of time needed to inflate the bag properly. During this process a dust extraction valve located on the other side of the dust hood is kept shut. When bag inflation is complete the filling process can begin provided the dust extraction valve is open. The air in the bag will of course be displaced by the filling process and take some dust with it so the design allows for the free passage of air/dust up through a cavity provided around the filler pipe and into the dust hood and out through the dust extraction valve. A pneumatically operated 150 mm butterfly valve was used for this duty. The valve actuator was controlled by the PLC via a solenoid valve and the valve open and shut positions were detected by limit switches. A sampling device was included in the bagging system to sample the mineral as it falls from the supply bin to the inlet of the bagging frame. The sampler was a Flow Force sweep – type stand-alone sampler with pneumatic actuator controlled via a 2-position solenoid valve by the bagging unit’s weight controller, a Flow Force XP Controller. The XP Controller ensures that sampling only occurs during bag filling and also allows easy adjustment of sampling intervals. The bags were weighed using load cells supporting a weigh platform on which a pallet and empty bag have been placed by the operator. (The bag’s corner straps have to be attached to support hooks and the bag neck has to be placed around the filler pipe). The platform together with the pallet, bag and bag support frame are all weighed with reference to an outer support frame onto which are mounted the dust hood, sampler, control cabinets and all ancillaries (eg access doors etc). The platform is equally supported on 3 shear beam load cells located so as to avoid any un-balance in the event of uneven mounting of the main support frame. On detection of the pre-selected weight (minus a value for in-flight weight) the XP Controller shuts the client’s feed valve and disconnects the bag from the bag support hooks and bag neck clamps. The powered actuators that control the bag support hooks and bag neck clamps are controlled by 3-position solenoid valves. The third position allows control air to be disconnected from both ends of each actuator so that the controlled device (eg support hook, neck clamp) simply hangs loose under gravity; thus posing no threat to the operator when disconnecting the full bag and positioning the new empty bag. This third position is activated whenever an access door is open. Movement: The weigh platform was clamped down (with purpose-designed clamps) to the main support frame to prevent the platform from jumping off the load cells during transportation between Australia and Africa. 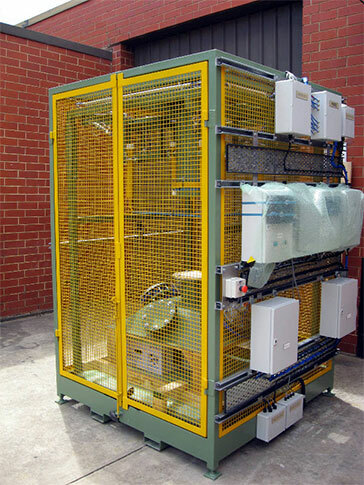 Size: The size of the bagging unit was too big for a shipping container so it was necessary to ship them in specially made wooden close-jointed crates. The internals of the crates had to be lined with moisture-proof tarred paper (to prevent moisture ingress in case of rain or sea-spray). The crates also needed special strengthening to prevent flexing during loading and unloading. To reduce height the dust hood was secured onto the weigh platform for shipping. Inspection by the client’s engineer using a local expeditor-inspector proved to be a stressful experience! We would prefer to have been inspected by the client’s engineers in person as they would be more familiar with the specifications and would know where departures could be accepted without compromising quality. Pre-verification of conformity to the quality and safety standards of the importing country was an issue between us and another inspector (a multi-national inspecting agency engaged by the government of the importing country to inspect all goods to be imported into their country from anywhere in the world). On the face of it, this also could have been an inspection nightmare! The listed codes of all the types of goods requiring inspection was in the vicinity of 500 but none of them actually fitted our bagging system. So we compromised on one code that was close enough for the purpose (with some qualifications). However the event, when it finally took place, was quite satisfactory, thanks partly to an “inspector-from-heaven” and partly to our own diligence with the necessary paperwork. Training of our African site engineer took place in Adelaide in March and now we look forward to site commissioning probably in August this year.